Written by JBKLabs exclusively for MCAA, this report found that most applications for safety professionals are geared towards documentation. There is a growing trend analytics on this data to identify root causes and trends. A companion webinar is also available. 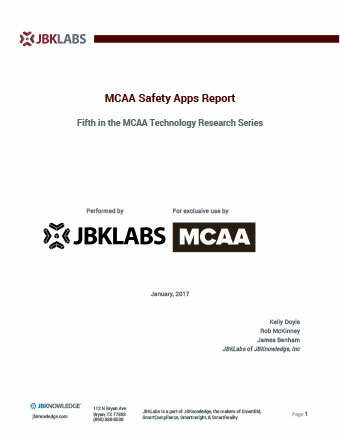 This webinar offers additional insights into the MCAA Safety Apps research report written by JBKLabs exclusively for MCAA. This webinar explores and compares the differences in products, software and processes that contractors will see when they begin to utilize 3D scanning technology. In the last of a four-part webinar series, ENERGY STAR, you will learn how to navigate the new and improved Portfolio Manager software. Recorded 9/10/13. In the third of a four-part webinar series, ENERGY STAR, you will learn about the many ways you can generate external and internal recognition for your participation in the ENERGY STAR program. Recorded 6/19/13. In the second of a four-part webinar series, ENERGY STAR, you will understand and feel confident about explaining the financial benefits of reducing energy consumption in commercial buildings. Recorded 4/17/16. The first of a four-part webinar series, ENERGY STAR, highlights the importance of compiling and entering accurate data into ENERGY STAR’s Portfolio Manager to ensure the accuracy of your energy performance score. Recorded 2/20/13. How can the GreenSTAR advantage add value and marketing smarts to your company’s business plan? To find out, view this enlightening webinar, which will provide you with important insights on the significance of being an MSCA GreenSTAR contractor. Recorded 1/30/13. In the fifth of the six-part webinar series, Building the Ultimate Sales Team, you will learn how to break down the barriers between divisions; develop incentives for cross-selling; train all staff on every service the company offers; and establish a cross-referral lead generation program. Recorded 10/30/12. In the fourth of the six-part webinar series, Building the Ultimate Sales Team, you will gain a better understanding of the technician’s role in sales; the pros and cons of hiring from outside/promoting from within; learn to identify best practices for transitioning technicians from field to sales; and attain guidelines for making technicians and field incentive programs effective. Recorded 8/22/12. Recording not available due to technical difficulties. In the third of the six-part webinar series, Building the Ultimate Sales Team, you will learn how to identify and define typical compensation terminology; understand selling behaviors and compensation theory; become familiar with different ways to pay salespeople such as salary, commission, and bonus plans; learn the differences in incentivizing projects versus maintenance; and attain a list of the Do’s and Don’ts for MSCA contractors. Recorded 6/20/12. In the second of the six-part webinar series, Building the Ultimate Sales Team, you will learn best practices to analyze and justify the reasons for adding new sales staff; identify ways to validate a candidate’s background, experience and potential fit; plan for the new hire’s arrival; develop a 90-day performance appraisal; how to discuss unsatisfactory performance – the right way and the wrong way; and know when and how to terminate. Recorded 4/18/12. In the first of the six-part webinar series, Building the Ultimate Sales Team, you will gain a better understanding of the required elements for an effective sales plan; how to forecast future sales; examine an actual sales plan case study; predict future revenue growth; integrate the sales plan with your compensation policies; and ensure sales plan success with proper training. Recorded 2/29/12. In the last of the seven-part webinar series, The Path to Higher Margins Is Not Business as Usual, you will learn how offering energy services can bolster your sales and help cement relationships with customers. You will also discover how to expand into plumbing service with minimal additional overhead or personnel. Plus, find out how to build a loyalty plan to secure commitment from existing customers. Recorded 12/3/14. In the sixth of the seven-part webinar series, The Path to Higher Margins Is Not Business as Usual, you will learn how to utilize existing or low-cost technology to answer customer demand for faster, more detailed information. In addition, how to make the best financial decision regarding whether to maintain or replace vehicles will be explored as well as strategies for streamlining office and overhead management. Recorded 10/22/14. The fifth of the seven-part webinar series, The Path to Higher Margins Is Not Business as Usual, will teach you how to implement a blended workforce to maximize labor resources, use the National Service & Maintenance Agreement as a tool to manage your labor force, and evaluate the profitability of an account. Recorded 9/10/14. The fourth of the seven-part webinar series, The Path to Higher Margins Is Not Business as Usual, will provide you with the skills you need to measure labor productivity and understand the value of labor mix and indirect burdens. You will learn the importance of engaging your entire service organization in understanding non-billable time and productivity. You will also discover how to get rid of timesheets to simplify your paperwork system and increase the profitability of your business. Recorded 5/21/14. In the third of the seven-part webinar series, The Path to Higher Margins Is Not Business as Usual, you will learn how to utilize scorecards to incentivize and motivate employees. Tips will also be revealed for instituting and communicating a clear, simple commission plan to motivate employees to increase sales. Hiring and termination recommendations will be reviewed. Recorded 4/9/14. In the second of the seven-part webinar series, The Path to Higher Margins Is Not Business as Usual, you will learn how to continually create an enjoyable customer experience to ensure a positive perception of your company and potential repeat business. You will also gain a better understanding of your customer relationships and reputation and how to best leverage those relationships. Recorded 2/26/14. In the first of the seven-part webinar series, The Path to Higher Margins Is Not Business as Usual, you will learn the importance of good leadership to inspire employees, and taking risks and thinking strategically about the long-term goals of your company. You will also discover how to create a culture of accountability and optimism, and to communicate a clear and strategic vision. Recorded 1/29/14. What separates the “good” team members from the “great” ones? What is it about that “star player” that makes him or her not just effective, but someone you want to retain as long as possible? In the last of the six-part “The TEAM Thing” webinar series, Steve Thomas discusses what some of those “great” qualities are, and what separates them from the “good.” He also recaps all six sessions to illustrate how all the concepts work together to form an effective team. Recorded 12/2/15. In the fifth of the six-part “The TEAM Thing” webinar series, Steve Thomas does a deep dive into specific characteristics of effective teams that you can develop as a leader to make your team more effective. With so much information to share on this topic, this is a two-part session. Recorded 11/11/15. In the fourth of the six-part “The TEAM Thing” webinar series, Steve Thomas discusses the make-up of a solid team foundation and how to achieve it from the ground up as well as how to rebuild it. Recorded 9/2/15. In the third of the six-part “The TEAM Thing” webinar series, Steve Thomas reveals the four kinds of team players that come to work and how to clearly define what an effective team player looks like for your team. Recorded 6/3/15. In the second of the six-part “The TEAM Thing” webinar series, Steve Thomas discusses what it means to be a “follow-able” leader; the four main qualities that people look for in a leader that also determine whether they will follow him or her; and practical applications. Recorded 4/1/15. In the first of the six-part “The TEAM Thing” webinar series, Steve Thomas focuses on the desire of every leader to build a “team” within their organization, teaching what it truly is (and isn’t), and how to embody it as a team player and a leader. Recorded 2/11/15. In the last of the six-part webinar series, Building the Ultimate Sales Team, you will learn how to analyze the status of your company’s sales culture, identify characteristics of a great leader, tell the difference between leadership vs. management and develop a personal action plan. Recorded 12/05/12.